For students, what is the most accessible archaeological site (and/or museum) for a brief (two-day) study of Roman Londinium? Without a doubt, the Museum of London. For starters, it still has part of the old Roman walls standing outside the museum, unmoved over two millennia. It also houses an impressive Roman gallery. Opening for the London 2012 Olympic and Paralympic Games, Our Londinium 2012 is the largest update to the Museum’s Roman gallery since it opened in 1994 and explores the parallels between Roman London and today’s modern capital. The updates range from video installations to rarely-seen Roman artefacts, including a bust of Hadrian which was found on the Thames foreshore and is now in the British Museum’s collection. The bust will be on display at the Museum of London until January 2013. Near the Museum of London is the City of London Guildhall Art Gallery... which happens to have a genuine Roman amphitheatre in its basement. 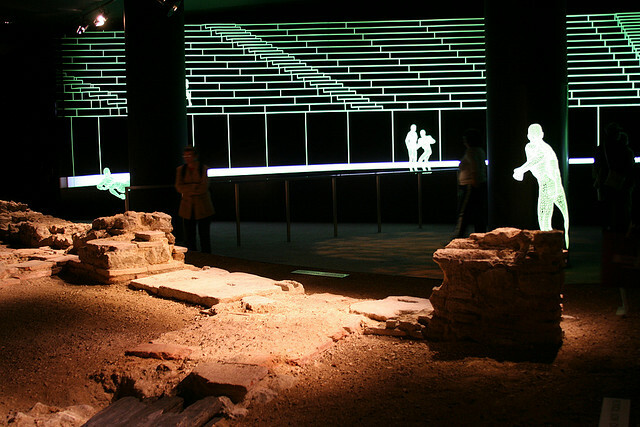 In 1988, Museum of London archaeologists made an astonishing discovery that changed the face of Roman London. The capital's only Roman amphitheatre was located in Guildhall Yard, during an archaeological dig taking place in preparation for the new Art Gallery building project. In 2002, the doors to the amphitheatre opened for the first time in nearly 2,000 years. You can enjoy free entry to the amphitheatre as part of your visit to the Guildhall Art Gallery. Requires some imagination - it's not exactly intact - but it's the real deal. Very occasionally it's used for events including theatre productions, but that's very rare. Be aware that with building work in the area, a lot of archeology is being done on old Roman sites, and a lot of interesting stuff is being found, including whole streets - though naturally this isn't usually open to the public. Much of the archiving and analysis is done at the Museum of London, who may be able to answer questions on it. There's also a Roman Britain section at the (free) British Museum. Not the answer you're looking for? Browse other questions tagged london museums archaeology or ask your own question. How much time to reserve for a visit to Mucha Museum in Prague? Where can one observe the Crossrail Skulls? How long should I expect to spend at the Smithsonian National Museum of Natural History? What is Admission + Wax Hand means in Madame Tussaud's Museum in Washington DC?